I'm having an out of body experience right now. For the first time in forever, I am completely post travel acne-free. This never happens as I always manage to bring home a pest in the form of a throbbing whitehead A trip to New York? Two or three. Guaranteed. Manhattan's damp and polluted air coupled with sleep depletion and too exhausted to care skincare regimen never fails to wreak havoc on my face. So what changed? The city was as grimy and humid as ever. And I got eight hours of sleep...per every two days. The game changer was Shu Uemura. I brought along the Shu Uemura Anti/Oxi cleansing oil and used it as both a a makeup remover and facial cleanser. Day and night, the foaming and non-comedogenic cleanser gently wiped away all remnants of makeup, pollutants, and other pore clogging culprits leaving my skin feeling clean, soft, and slightly glowing. No wonder it's the the #1 selling cleansing oil in the world. This was my first time using a cleansing oil and needless to say, it won't be my last. I used to be quite skeptical about using oils on my face as I feared they would clog my pores. After all, the word "oil" usually conjures images of artery clogging fried chicken. And there's no way I'm slathering chicken thighs on my face. But the science behind using oils to cleanse the skin actually makes a lot of sense as it's much easier to dissolve dirt and buildup with an oil based cleanser. 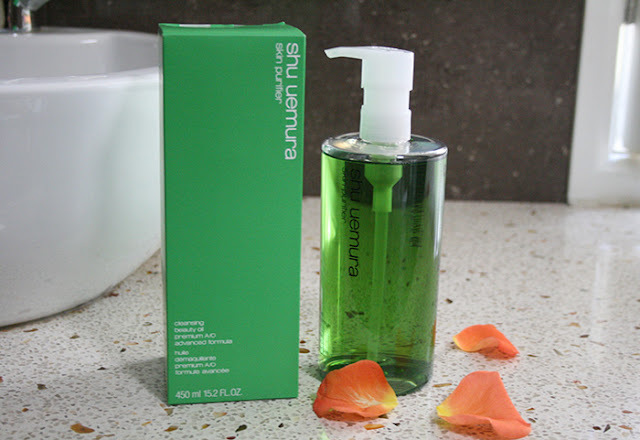 And the ingredients in Shu Uemura's cleansing oils include pure green tea, Gingko leaf and Moringa extracts which I doubt are part of the colonel's secret recipe. Oil me up! Don't forget to stock up on your favorite Shu Uemura cleansing oils with the promotional 10% off coupon code FABSHU. Sounds Good, This is going to be on the top of my shopping list.